Riders and operators give the new bus tickets a big thumbs up! TriMet has been testing out ticket printers on two bus lines that produce easier to read, more durable tickets than the flimsy newsprint transfers riders are used to. The response – from both riders and operators – has been overwhelmingly positive. Now comes the hard part. The trial ends at the end of service today, April 12. That means the ticket printers will go dark. Riders who have enjoyed the new tickets and operators who had a break from punching and tearing slips will have to endure the old system again until late May when a gradual fleet-wide rollout begins. The new printers should be in place and running by July 1. Before the printers can be installed on all our buses, tweaks will be made based on feedback we received during the trial. Among the changes, riders said that while the tickets were definitely more readable than the transfer slips, they’d like to see the date and validation time made larger. We’ll make that adjustment along with increasing the color contrast of the buttons on the console the operators use to select a fare. While the current bus transfers are supposed to be good for two hours, they are not very precise, meaning some riders get longer than two hours and others get less. The new 2-hour tickets will be good for just that – two hours – and will match those fares on MAX and WES, making transfers less confusing. With the new validated 2-hour ticket, just like with the old transfers, you can ride any combination of buses, MAX and WES trains and streetcars. When transferring, you just need to board for the next segment of your trip before the expiration time shown on the ticket. If you are on a vehicle when the ticket expires, you are still able to complete your trip. Keep your ticket handy until you complete your trip as it’s your proof of payment. 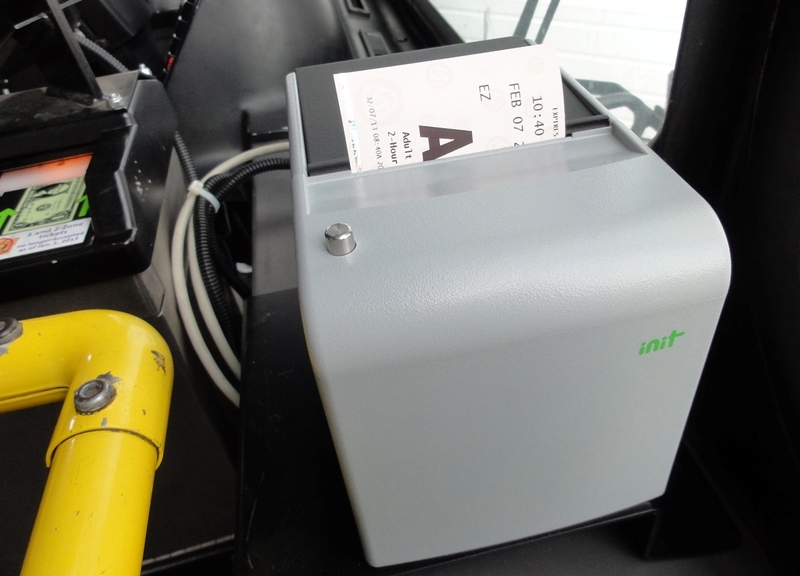 Unlike the ticket vending machines found on MAX and WES platforms, the bus printers are located inside the buses and are about the size of a toaster. They are produced by INIT, a leader in Intelligent Transportation Systems (ITS) and fare collection systems. The cost of the ticket printer system is $1.5 million.